Just before the entrance to Showdown Montana Downhill Ski Area, is a parking lot at the top of Kings Hill. In the winter, Nordic skiers and snowshoers ski the lift and instead take the fire road from the parking area up to the Porphyry Fire Lookout. The trail is roughly 1.33 miles with a gain of 1,500 feet. Views from the top are great and the trail is heavily wooded so wind is typically not a factor. You can also depart from the ski area itself. Snowshoe rentals are available there. Showdown offers food and local microbrews for an after workout cool down. This steep and challenging trail travels up the ridge behind the King’s Hill Cabin for a mile then travels across the ridge for several miles before descending steeply into Deadman Creek where it crosses Highway 89. 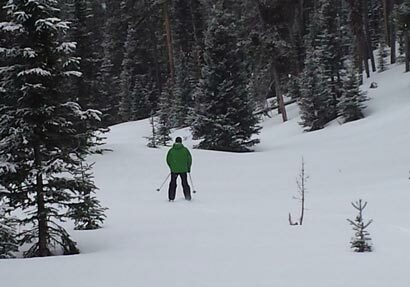 The trail is ungroomed offering snowshoers and skiers a back-country experience. The trail is fairly well marked with blue blazes. Snow can be deep and blown-in at times. A car shuttle is needed for this trail. To access the trail, travel Highway 89 approximately 67 miles south of Great Falls to the summit of King’s Hill. A large parking area is located on the east (left) side of the highway and the trail behind the Forest Service Cabin. 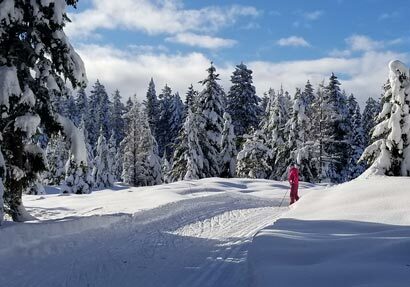 A mostly gentle ungroomed trail traversing the shoulder of Showdown Downhill ski area then gliding through thick forest to the town of Niehart. A car shuttle is necessary for this trail. The trail is fairly well marked with blue blazes. 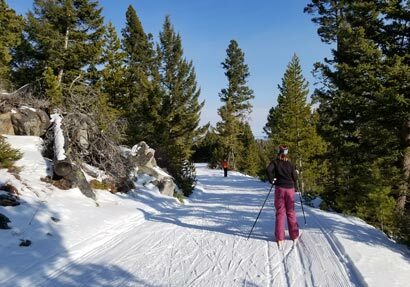 Expect to see several other skiers on the weekend and some local groups ski this trail weekday evenings with headlamps. Parking is available near the King’s Hill Campground entrance on the west side of Highway 89 approximately 67 miles south of Great Falls. An ungroomed trail on a closed forest road along a bubbling creek. 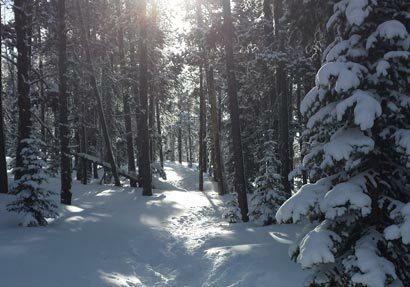 This popular trail is suitable for snowshoes or skis. The grades on this trail are gentle making it an excellent choice for beginners. Take Highway 89 for 60 miles from Great Falls and park in the turn-out ½ mile south of the Memorial Falls trailhead. This trail is dog friendly. Departing from the Teton Pass Downhill Ski Area parking lot, snowshoers and Nordic skiers can continue over Teton Pass on the ungroomed road. The trail descends briskly for the next two miles before reaching the West Fork Campground at 3.4 miles. The campground is obviously closed for winter but it’s a nice spot for a picnic before ascending out of the valley. The Autumn Creek trail departs from the Marias Pass summit on Highway 2 along the south side of Glacier National Park. Parking may be available along the railroad tracks, but if not, the parking lot across the street with the monument and restroom is typically plowed. Cross the tracks, look for orange blazes leading into the trees and follow the trail from there. 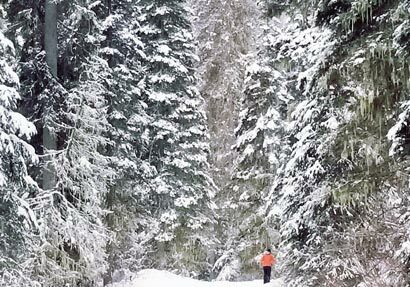 Abundant snow and great views of make this a fun trail. This trail is not regularly groomed. This area or the trail that leaves from the monument parking lot is also popular with snowshoers. What could be more beautiful than Glacier National Park and within the park, the Two Medicine area is scenic paradise. Elk and even wolves frequent this area in winter so look for tracks along your route. This area can also receive high winds that blow the road free of snow for the first mile. Some locals bring a mountain bike to ride the first mile before departing on skis. The trail starts at end of the plowed road (usually 4 miles north of East Glacier) near the junction of Highway 49 and the Two Medicine Road. Popular destinations include: Park Boundary, 6 miles round trip – Running Eagle Falls, 10 miles round trip – Two Medicine Lake, a strenuous and hilly 16-mile round trip. 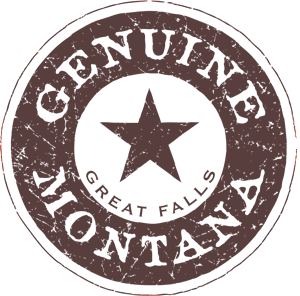 This area consistent of several short marketed loops with limited grooming. The trails glide through the aspen, meadows, and mixed conifer stands in the rolling hills east of St. Mary Lake. The distances are one mile for the Lion Loop, 2.5 miles for the Eagle Loop, and 3.5 miles for the Elk Loop. This entrance to this trail is near the St. Mary’s Entrance to Glacier National Park. The Blackfeet Tribe requires a permit, obtainable at the tribal Fish & Game office in Browning, to ski on the reservation. This trail is much easier to ski downhill from the highway on Hudson Bay Divide to the Hudson Bay District Office trailhead. Start at an orange stake on Highway 89, 4.5 miles south of St. Mary. Begin on the logging access road which skirts the bottom edge of several clear-cuts, then descends to Divide Creek. Use caution when crossing the creek and climbing out along the steep, narrow hillside. The route then follows the old highway route to the Red Eagle Trail and back to the trailhead via one of the loop accesses. This route is recommended for intermediate to advanced skiers. This entrance to this trail is near the St. Mary’s Entrance to Glacier National Park. 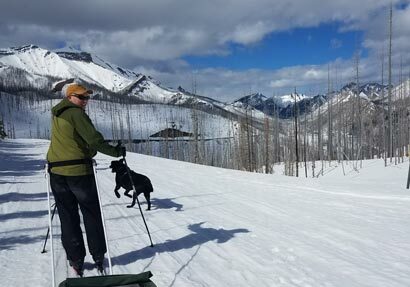 Follow the first part of the Eagle and Elk Loops to the old fire road, now called the Red Eagle Lake Trail, and ski the rolling terrain to the scenic bluff overlooking Red Eagle Creek. There are great views of the mountains along St. Mary Lake and the Red Eagle Valley. This entrance to this trail is near the St. Mary’s Entrance to Glacier National Park. This trail is good for skiing or snowshoeing. Take the right fork of the road at the closure and ski past the houses until the road turns to a trail. The trail soon joins the road to Fish Creek Campground and the Inside North Fork Road. Bear left past the campground. The improved road soon turns to a narrow climbing gravel road. About 0.2 miles north of the Fish Creek Campground, take the McDonald Lake Trail on the right, just before the gate on the road. The trail winds down a short hill but the route is fairly level for the most part. Ski left at the first trail junction then right at the next one shortly thereafter. The forest opens as you approach Rocky Point, where there are beautiful views up and down Lake McDonald. 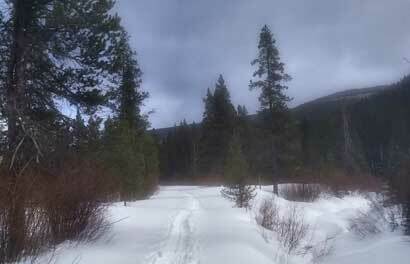 The trail begins just south of the McDonald Creek Bridge and is good for skiers or snowshoers. The best access is the summer bike/foot path. This entire area is a good place to explore on your own. 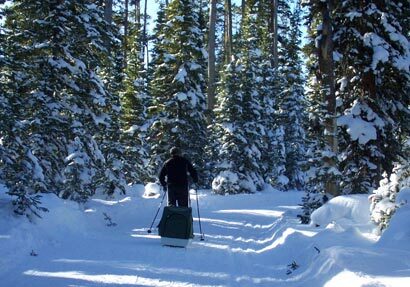 The gentle terrain along lower McDonald Creek provides easy skiing through the forest with side trips along the creek. 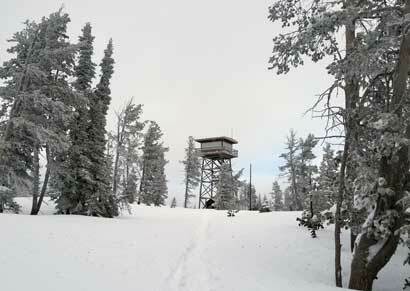 A long and sometimes steep accent to a fire lookout with incredible views. Park at the plowed area in front of the barn and follow the left fork of the unplowed road across the Quarter Circle Bridge. Take the right fork and follow the road .5 mile until the actual Apgar Lookout trailhead is reached. After an easy start the trail steepens and climbing skins may be necessary for the trip if conditions are icy. The views are great from the lookout but this trail may be very difficult for beginning skiers. Park in front of the barn and follow the left fork of the unplowed road to the Quarter Circle Bridge (.5 mile). The trail provides good views of the McDonald Valley, and the Middle Fork of the Flathead River, before entering the forest. Take the left fork at the road junction 1 mile from the bridge. An exceptional view of the river is located 2.5 miles from the junction, 100 feet south of the road, across from an open hillside. The remaining building was burned in the 2003 Robert Fire, but this is still an excellent ski trip and the view is of the bluff above the confluence of the North and Middle Forks of the Flathead River. Take the right fork of the road at the closure and ski past the houses until the road turns to a trail. The trail soon joins the road to Fish Creek Campground and the Inside North Fork Road. Bear left past the campground. The improved road soon turns to a narrow climbing gravel road. From this point it is 3 miles to the first meadow. Continue over the crest of the hill to an orange marker identifying the trail to McGee Meadow. 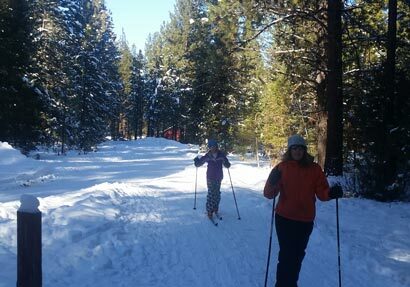 Ski along the northern edge of the meadow until you see the opening for the car pullout to the west, on the Camas Road. After a couple of short uphill sections, the route descends to the road closure. This trip can be done in either direction, but going up the Camas Road is more strenuous. 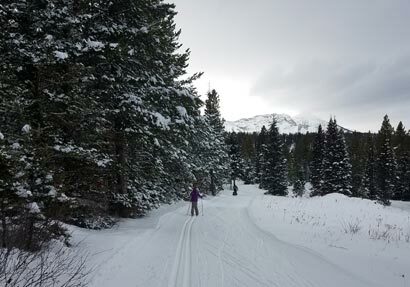 Crosscut Mountain near Bridger Bowl operates an excellent Nordic center with 28 km of trails. Crosscut also offers lessons. Directions, prices and more information can be found at https://www.crosscutmt.org/category/crosscut-mountain-sports-center-news . Waterton is an exceptional winter destination. The park has several km of groomed cross-country skiing trails. There are also numerous popular snowshoe trails including several to viewing areas of the parks remarkable waterfalls which freeze in winter. Waterton also hosts a winter festival each year. For further details, visit: https://mywaterton.ca/ .